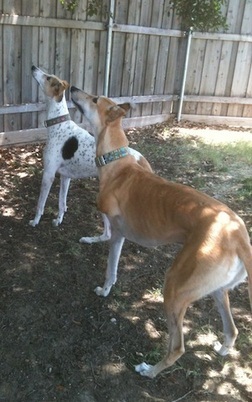 We have fostered for GALT since 2004 and have had dozens of greys come through our doors. While every dog is special, occasionally there is one that fits in so well with our pack and squirms its way into our hearts that we absolutely cannot fathom thinking about letting go. This happened with Baron. We already had 5 dogs and had no ideas of adding on, but it became more and more apparent that Baron was too good to let go. 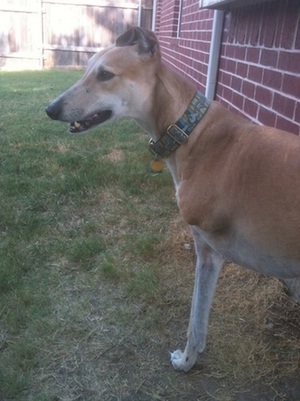 Baron had broken his front left leg at Gulf Greyhound Park and subsequently developed a serious bone infection which necessitated the amputation of the limb. Since the surgery, Baron has never skipped a beat and is the fastest dog in our backyard! In public, people want to feel sorry for him, but I quickly explain that he is the happiest dog in the world and still runs and plays like the 4-legged variety. Baron is a constant reminder that life is always worth living despite any setbacks we face. We are so fortunate to have him in our lives!